Goutierrez didn’t know it at the time, but he was very instrumental in promoting Cajun when Cajun was not even popular. It was at this time in history that Louisianans like Gouteirrez became aware of our rich family traditions and he, along with many others, began proudly promoting Cajun food, Cajun music and Cajun culture. Today he has a Cajun menu in French for the many tourists that frequent Vermilion Parish and Lynn G’s. Lynn was born May 13, 1948 one of seven brothers. His parents were Ledie Marie Brasseaux Goutierrez and Ned Edward Goutierrez, Sr. As a child, Lynn remembers the family boucheries, in which for two days, the family would butcher the biggest hog, cook, cut and wrap and divide the meat among the relatives. He has vivid memories of homemade sausage drying on the clothesline on a sunny day. While visiting Grandpa Aubrey, he remembers that everyone spoke French and always stopped whatever they were doing to listen to Couzan Dud on KROF radio on Sunday afternoons. This simple family life no doubt had a profound influence on his Cajun heritage and cooking skills. Lynn attended Erath Elementary and graduated from Erath High is 1966. While at EHS, he excelled in sports under the coaching of Willie Lutring in football and Bob Segura in track. He married his high school sweetheart Connie Clement. While working for Texaco for over 24 years, Lynn trained and raised horses on the side. He ran his horses on the country bush tracks that are now almost obsolete. But his real passion was cooking. Because he was always experimenting with new recipes, Lynn always found himself cooking dinners for a house full of family and friends. In 1988, Lynn and Connie purchased a modest drive-thru daiquiri business in Abbeville. Goutierezz soon realized that the Cajun home cooked plate lunches he offered were selling faster than the daiquiris. From the very beginning, customers were constantly telling him that he had the best Cajun cuisine in Vermilion Parish and they convinced him to open a restaurant. That was the beginning of Lynn G’s Seafood & Steakhouse. He attributes the success of his restaurant not only to his wife, Connie, but also to his mom and family members who unashamedly assisted him preparing meals in the kitchen in the first years of business. He joined the Acadiana Restaurant Association and served as President, Vice-president, Secretary and Treasurer. 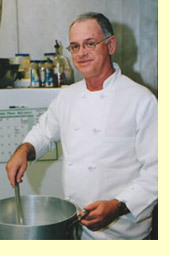 He was nominated and continues to serve on the Board of Directors of the Louisiana Restaurant Association. Goutierrez has been a major supporter of various Vermilion Parish non-profit organizations over the years, such as St. Theresa Family Bazaar and Famille des Erath, including too many others to mention here. Over the past 15 years Goutierrez had received many awards for his culinary skills such as Restaurateur of the Year awarded by the Acadiana Restaurant Association, and Restaurateur of the Year awarded by the Cattlemen’s Association of Abbeville. He has won first place in the seafood division, meat category, and gumbo cookoff s while competing in professional cooking contests.